In January 1999, CRI, operating through the International Centre for Environmental and Industrial Toxicology (ICEIT) in collaboration with the Asian Institute of Technology (AIT) and Mahidol University (MU), opened the interuniversity postgraduate program, at Master's and Ph.D. levels in Environmental Toxicology, Technology and Management. These innovative, multi-disciplinary programs combine health sciences, biotechnology and environmental engineering. 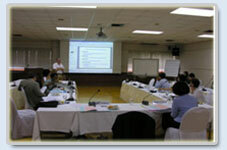 The curriculum has been designed by a team of international experts with support from the United Nations Development Programme to train human resources capable of undertaking control and management of toxic chemicals, as well as research and development in the areas of environmental toxicology, technology and environmental management. The graduate students in this program come primarily from countries in Asia and the Pacific region such as China, Nepal, Indonesia, Bangladesh, Laos, Mongolia and Myanmar, but in the past years, there have been graduate students from Finland as well. 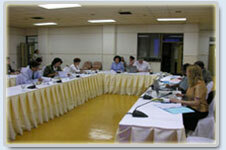 It is an international program with world renowned international experts in the teaching faculty. Some courses are operated as a joint-effort between the program and leading foreign institutions such as Massachusetts Institute of Technology, U.S.A.
Linkages have been established with various institutions in Europe and North America to conduct collaborative research and to supervise student dissertation research. Opportunities exist for Ph.D. students to receive research training at world renowned institutes in USA , Europe , and Asia . Graduates of this professional degree program will have the opportunity to familiarize themselves with global and international issues associated with chemicals and hazardous wastes and the current strategies to manage and solve problems through teaching by international experts from North America , European Union, etc., and experts from international organizations who will join the program as visiting professors. In 2003, the program established a cooperation agreement with University of Utrecht in the Netherlands to offer the possibility for students from both sides to participate in our respective Ph.D. programs according to the specific requirements set for each program and to take another degree.